The story of the human race is a long one, and just as long is the story of property ownership. Hammurabi listed over fifty stipulations in his Code defining the rights and duties of owners. The prophets of the Chosen people had their say concerning property. Plato and Aristotle philosophized on the nature of property. Nor did the New Law by-pass this problem; It confirmed the seventh commandment and founded its law of charity and generosity upon ownership. St. Augustine, St. Ambrose, and many of the other Church Fathers spoke out on this problem. The Manichaean heresy rose its ugly head condemning ownership because of its fundamental doctrine that all material things are by nature evil. 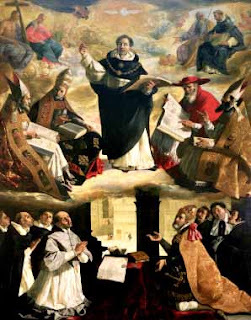 St. Thomas Aquinas supplied his contemporaries with a complete doctrine of ownership. During the Middle Ages this Thomistic doctrine prevailed in society, but not for long afterwards. With the world veering from its Christian course after the Reformation, the scourage of an individualistic philosophy fall upon the human race. And one of the consequences of this philosophy was the positing of property rights as absolute rights. Because of the many abuses caused by this extreme notion of property, the natural and obvious reaction followed, namely the demand for the abolition of all property rights. The outstanding proponent of this extreme was Proudhon, who defined property as theft. This latter theory of property was popularized by the Marxists. Both of these philosophies – liberalism and communism – contend that theirs is the road to freedom. But experience belies both their theories. The Thomistic philosophy of property alone can guarantee the freedom which the extremists promise but never produce. For what reason have the communists and extreme capitalists failed? Fundamentally it is their false philosophy of man. More immediately they fall because they never ask the question “why” with regards to property. An excellent example of this method is the contemporary attitude towards freedom of speech, freedom of the press, and the like; freedom is not something absolute – that is, something to be sought for itself – as many moderns like to think. A man is free to say what he wishes in accordance with his end as a man. Hence these freedoms cannot be used indiscriminately, but only inasmuch as they achieve their end; once they deter from their end they are not good. Property ownership is like freedom of speech. We must determine what its end is before we can establish its nature, and how it is to be used. Property, like freedom of speech, is not an end in itself, but a means to an end. The Thomistic approach avoids the pitfalls of the extremists because it determines the purpose of property, then proceeds to legislate how it should be used. The first premise: Everything outside of man is for man. The end of things is that they serve man. Now to determine in what way men should use these things, the end of man must be known. According to St. Thomas the end of man in this life is three-fold: 1) self-preservation – food, clothing, shelter, 2) propagate the species – familial order, and 3) intellectual and societal life – the good life. Recognizing these two factors - namely, that the things outside of man are for man, and the three different ends of man - the next step is to determine how man should use these external things so that he will realize these three ends. Here is where the question is asked: What is the best socio-economic order? What disposition of things is most likely to guarantee the rational use of land, cattle, buildings, and resources? From experience, that is from observing men living together, reason demands that the goods of this earth should be held privately. As St. Thomas states, in procuring and dispensing of the goods of this earth, they are to be held privately but their use is to be common. So the Thomistic position states that property is both individual and social, the former is implemented by wide distribution, and the latter is implemented by the ordines. Property distribution and the ordines go hand-in-hand; they complement each other. Ownership looks to the welfare of the individual, while the ordines look to the social aspect of property. This is the disposition of property which facilitates the proper use of this world's goods. The institution of private property affects the greatest economic good for society. However, that is not all it does; it affects more than the ideal economy. Private property is the foundation for human liberty. In fact St. Thomas distinguishes between the slave and master in this way. "Slaves do not have the ability of resisting the rule of their master, because they own nothing of their own..." Whereas free men are those who: "...have something which they own by which they may resist the command of a ruler." However, now-a-days many people have little esteem for real liberty; they will very readily forego it for a superabundance of material goods; they, in a sense, willingly become slaves. This is an inversion of values which promotes both the laissez-faire, and communist philosophy. Among contemporaries, Pius XII is he greatest campaigner for human liberty. He condemns an overweening paternalism in both economic and political life; he condemns the extremist positions outlined above because under both of them man is: "...condemned to an academic dependence and slavery which is irreconcilable with his rights as a person." He condemns: "...trust in an Omniprovident State to secure, for each of its subjects and in every emergency of their lives, the right to make demands which must eventually prove to be unattainable." And just recently in an address to a group of farmers, he urged these men to remain faithful to their vocation: "...which will always be particularly exposed to risks, but which for this very reason is a model - at present not sufficiently recognised - of human effort." He continued, saying that he was making this recommendation: "...at a time when unfortunately too many are afraid to take personal risk and seek security at the cost of independence." This word of advice is applicable not only to the farmers, but to everyone. His Holiness is urging men to be and act as men, that is, to act as the intelligent and free creatures which they are by nature. The means to this end, in the mind of Pius XII, is to make as many responsible owners as possible. This is but a short resume of the natural, rational, and Catholic explanation of property. There are books which furnish a complete explanation of this problem; besides the Papal pronouncements there are a number of contemporary writers who treat this problem at length. A few of these are: Bishop Fulton J. Sheen, Hilaire Belloc, G.K. Chesterton, Oswald von Neil-Breuning, S.J., Henrich Pesch, S.J., and Gustav Gundlach, S.J.. Nor need the Catholics think they have a monopoly on this theory of property. Adolf A. Berle, Jr. in his recent book, The 20th Century Capitalist Revolution, defends this position; the neo-liberal Wilhelm Roke, an economist at the University of Freiburg, defends the Catholic position in his two books, Social Crisis of Our Times and Civitas Humana; also the Temporal National Economic Committee reports favor the position just outlined.